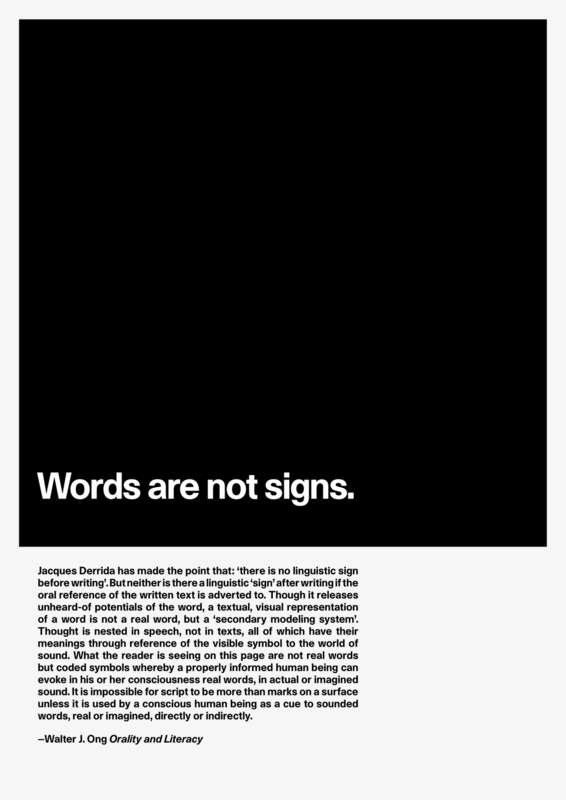 I have further refined the typography on these posters for Design and Rhetoric. 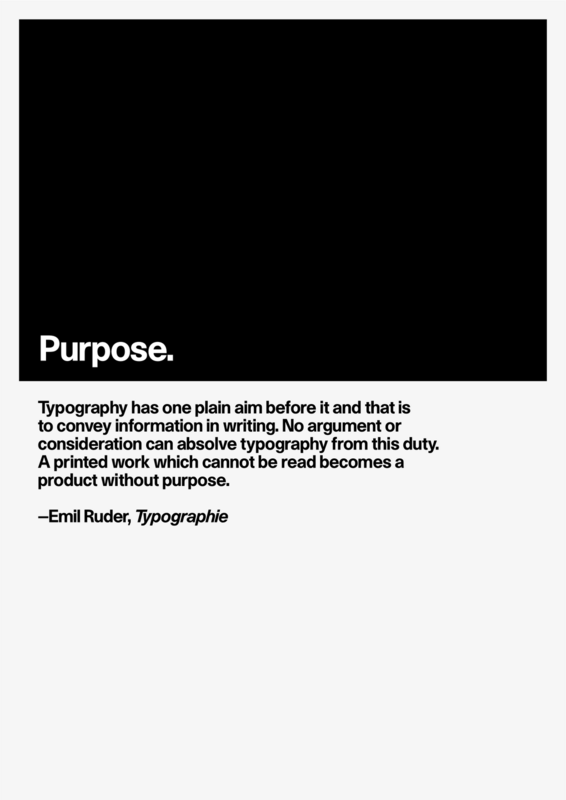 I was unhappy with the justified type on the body text because, on reflection, it looked too static. I have ranged the type left and have spent some time refining the rag, I think this looks more lively now and is, I think, easier to read. I have not used any hyphenation. I have also subtly altered the position of the 'title': I think this creates more tension than in its previous position. 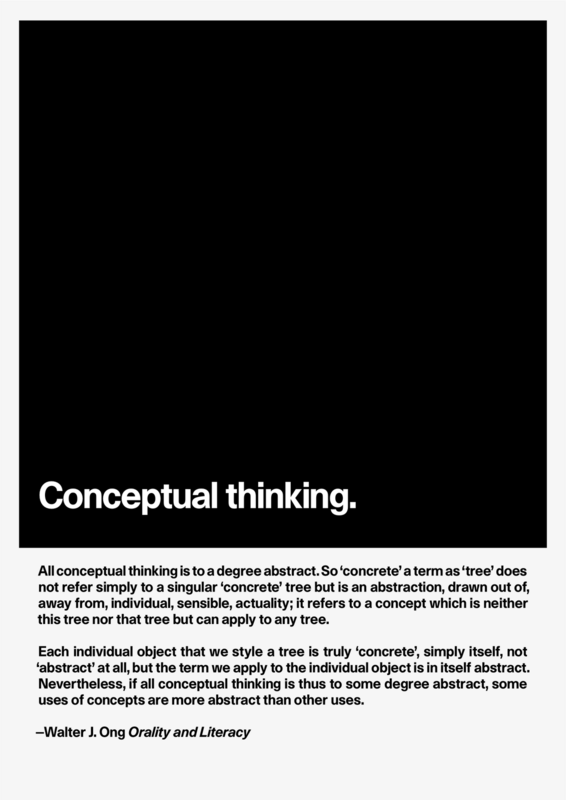 Further refinements of my posters for Design and Rhetoric. Hopefully, these are getting closer to a final outcome. See also Typographic Hierarchy 1, 2 & 3. 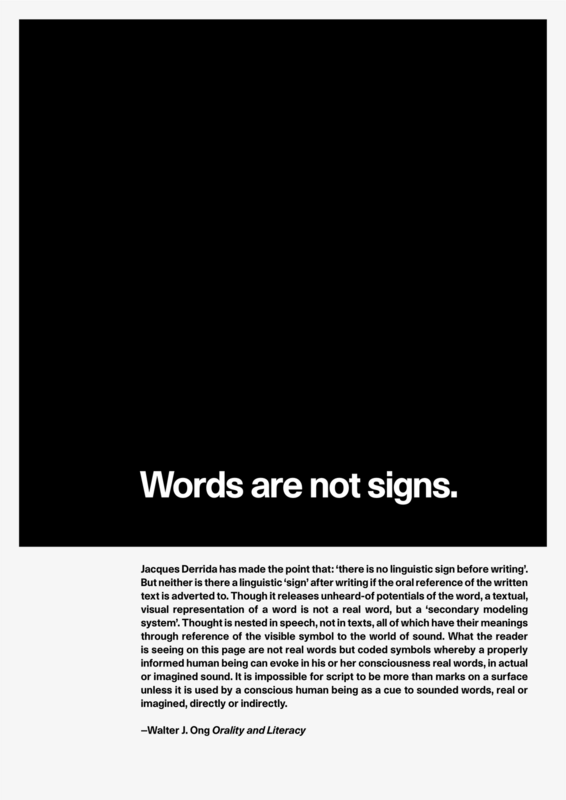 These are revised versions of the Typographic Hierarchy Workshop poster. General feedback is that the 'bouncing' numerals version reversed out of black is the strongest version. I've included a black on white version for comparison. 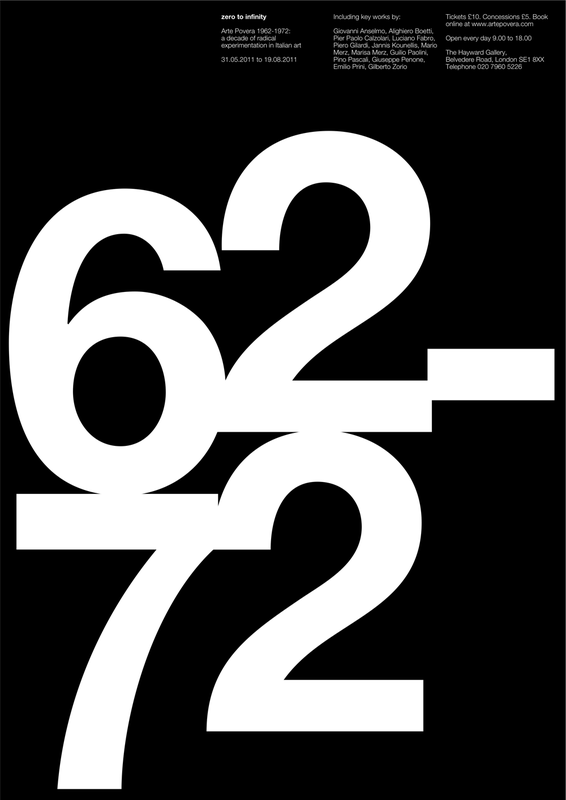 I've slightly enlarged the numerals. They now bleed more emphatically. 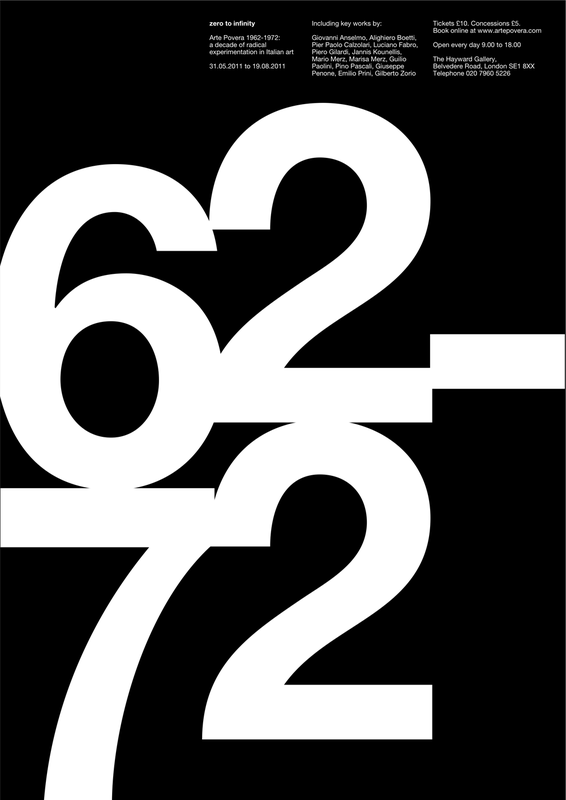 The 6, in particular is bleeding off the page at the left - I was quite cautious about this in the previous versions, particularly in the black on white versions where I felt that this created a 'flare' or 'dazzle' on the right of the page with a too-strong emphasis on the cropped-off curve but, on reflection, I think that in the reversed out versions, this is not so apparent and helps amplify the play on field/ground. 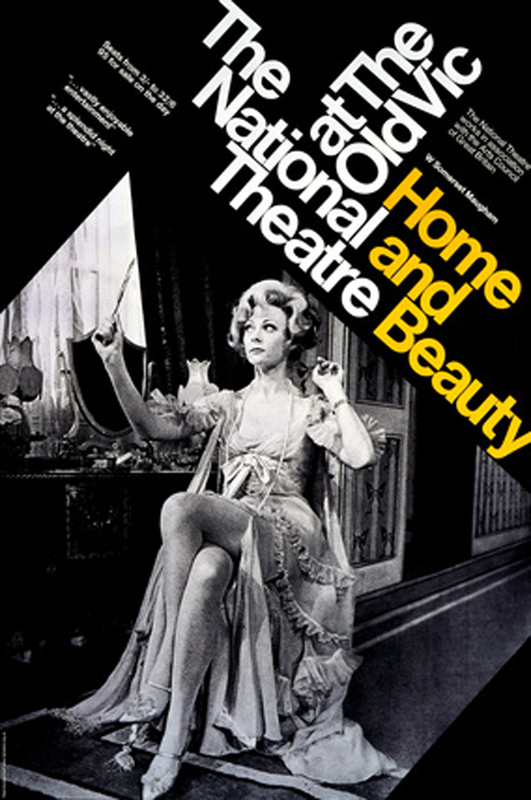 I've refined the type at the top of the poster. I've used Roman (55) instead of Light (45) with Bold (75) for the title to give the type more weight and emphasis. I've broken it up into three clusters to create a hierarchy of the types of information. 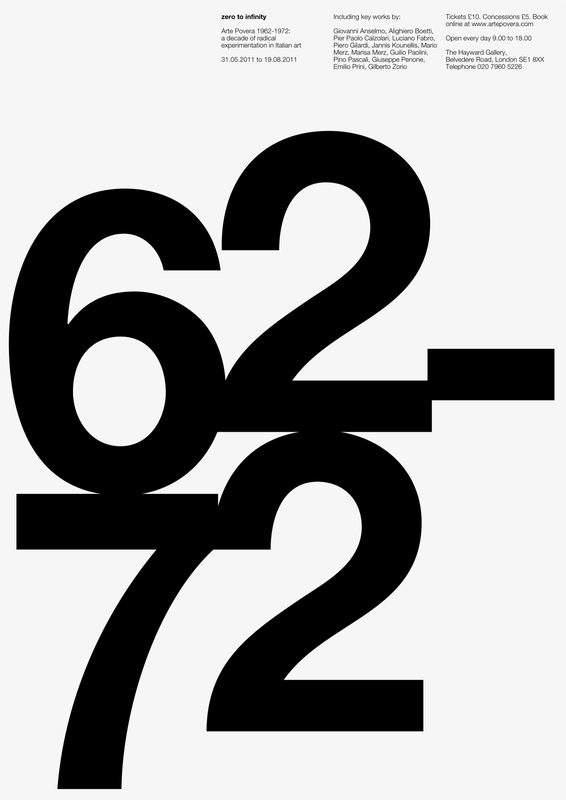 I've aligned the information in two different ways: one which follows the grid established by the numerals and one which aligns against the dominant 'bouncing' 2. I was trying not to break the names in the list of artists but, I could not find a solution for this unless the names are arranged non-alphabetically. 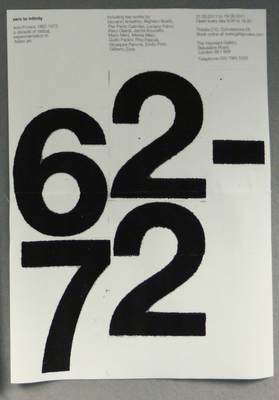 Below is the development of the worked-up versions of the paste-up poster I produced in the typographic hierarchy workshop. 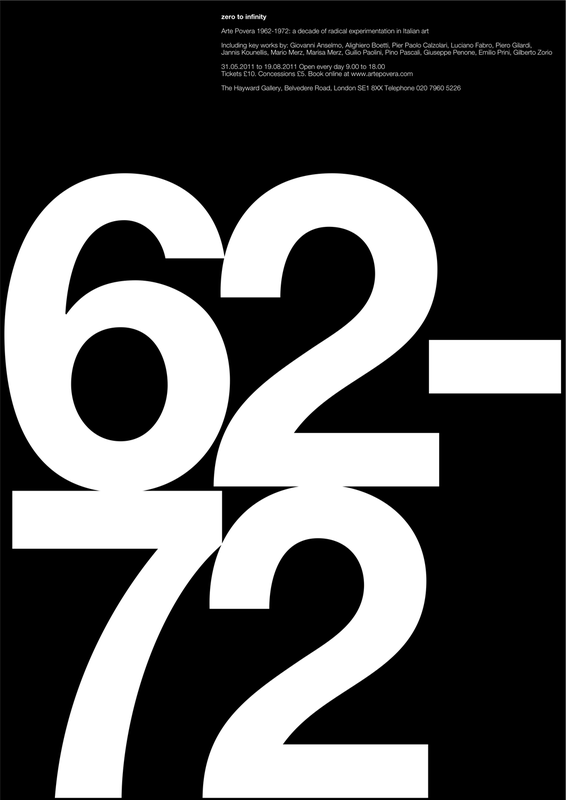 I decreased the spacing between the numbers and moved the dash – it now relates to the 6 rather than the 2 which is 'wrong' but visually, I think it works better; I like the stepped horizontal line. I also changed the relationship between the 7 and the 2 in the bottom pair. 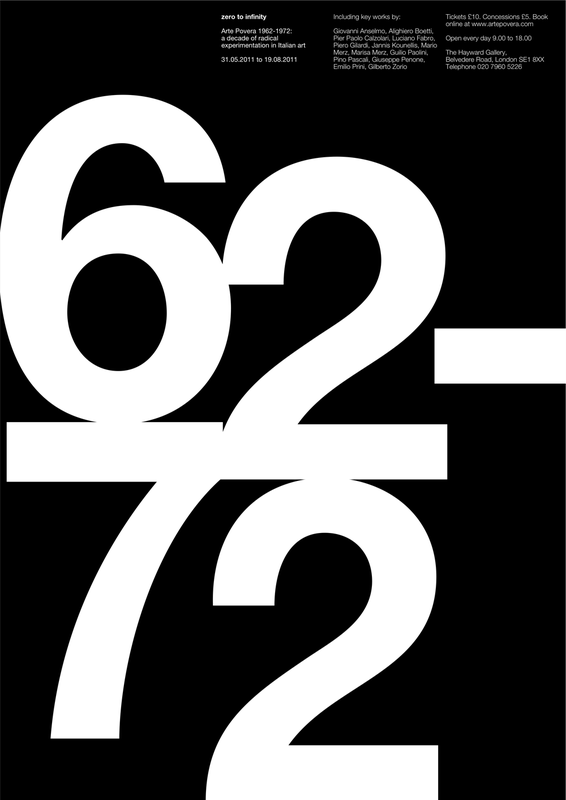 I tried a couple of alternatives: with the numbers 'bouncing' in a slightly different way and another version with the numbers more static. I think I prefer this final version: it’s simpler but I think it has a much stronger composition and the shapes between the various components are much more satisfying to look at. The rest of the information is simplified from the workshop version though I hope I have still created a hierarchy between the different types of information. I have tried various alternative ways of presenting this information, aligning with different elements in the design. The final image in the gallery is the paste-up workshop poster. 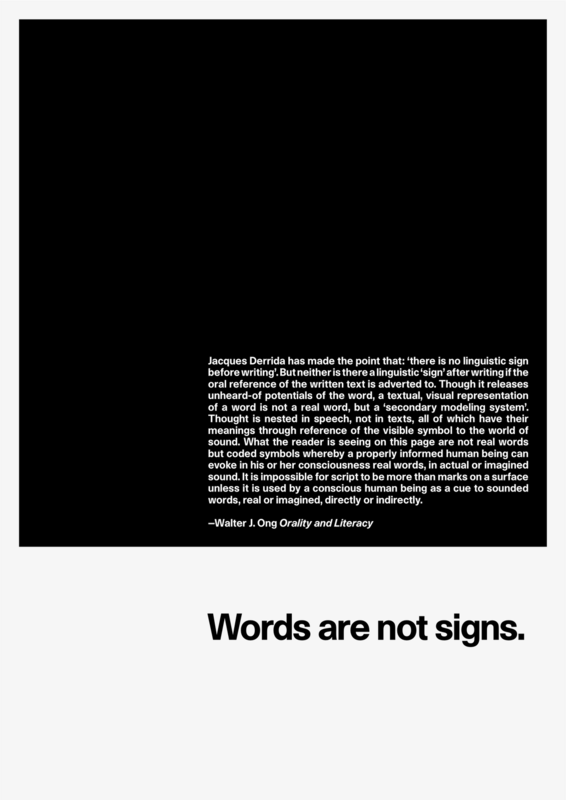 I reversed the colours on some of the versions above because the blog has a white background. On reflection, I prefer the reversed out of black version - it's stronger and the ambiguity of the figure/ground is more explicit. My work in Unit 2.3 Design and Rhetoric has looked at language, in particular, the relationship between speech, writing and text. 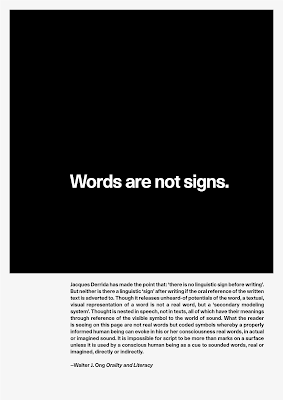 I am interested in how thought is mediated through writing and how ideas are disseminated through print. 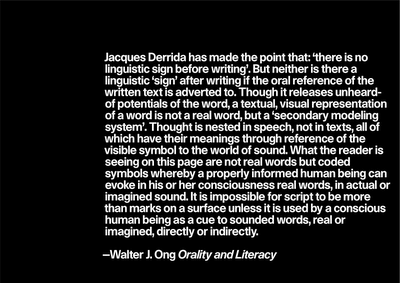 At the core of this is the Saussure’s idea of typography being a faulty transmitter at one remove from writing which itself is one remove from speech. 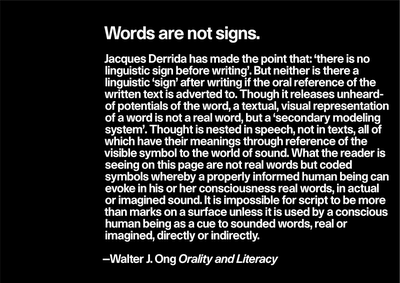 To try to understand better this relationship between speech and writing and between speech, writing and typography, I have read Visible Signs: An Introduction to Semiotics and Left to Right: The Cultural Shift from Words to Pictures, both by David Crow; This Means This, That Means That: A User’s Guide to Semiotics by Sean Hall and Orality and Literacy by Walter J Ong. 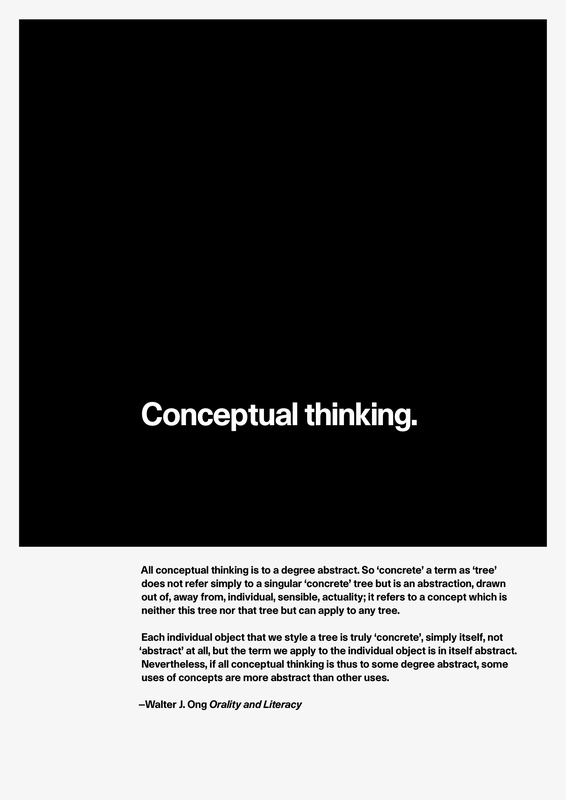 My initial research for Unit 2.3 Design and Rhetoric tried to uncover the ‘meanings’ of typefaces. 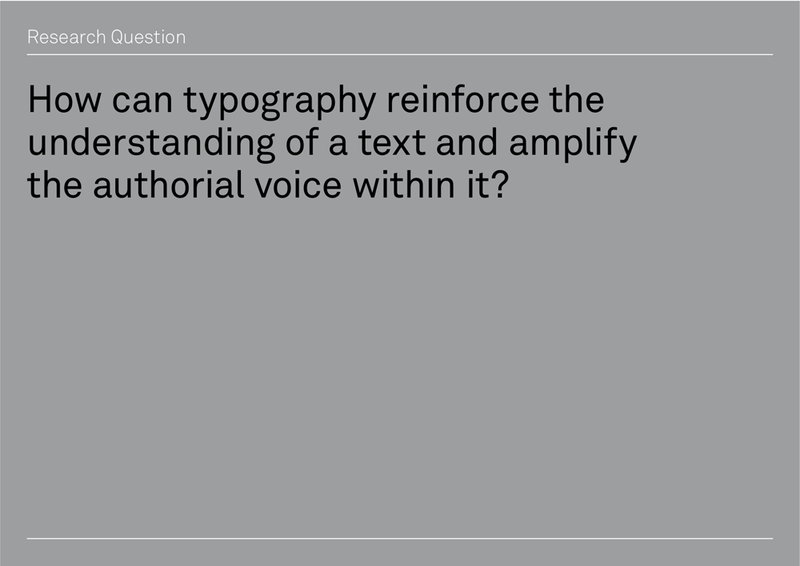 I used various practical tests to see if it was possible to decipher the effect of different typefaces on texts. 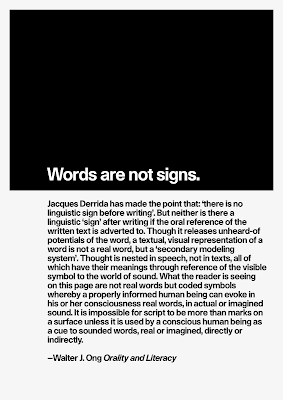 I realised that this was too subjective a task: the meaning of texts is always in flux and although typefaces can – and do – transmit meanings it would be difficult to decipher this meaning other than describing the atmosphere that they create. 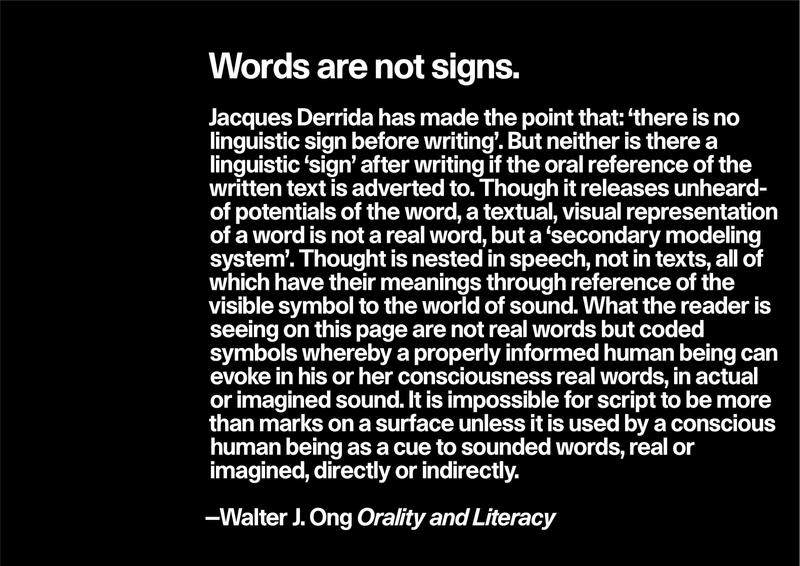 I started to think about how meaning might be – if not fixed – then amplified by typography. 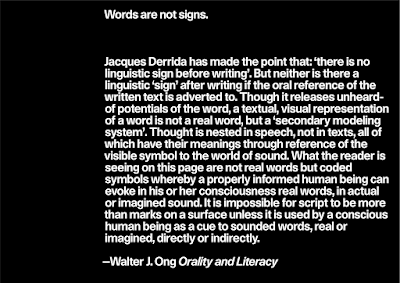 I began to research the ways in which designers use typography to direct or control the reading of a text. 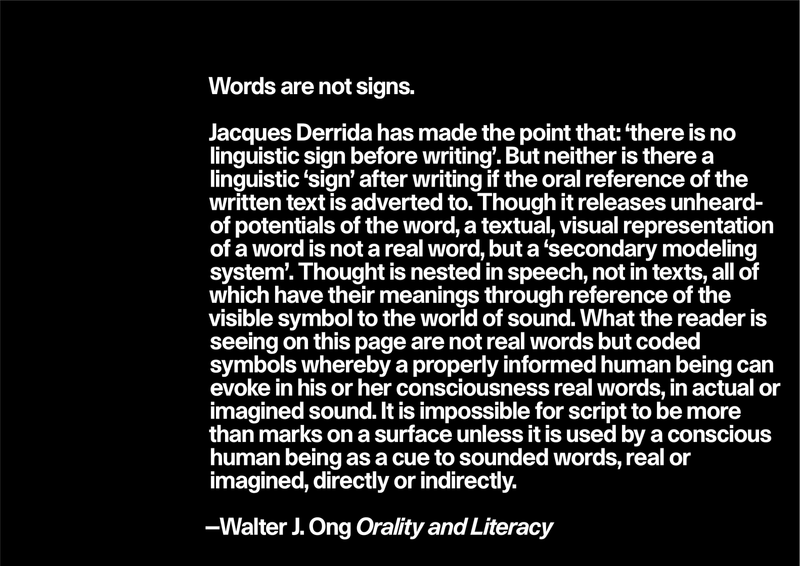 To some extent, this idea is still rooted in the modernism/post-modernism dichotomy: type as neutral carrier of information on the one hand, self-expression on the part of the designer on the other. 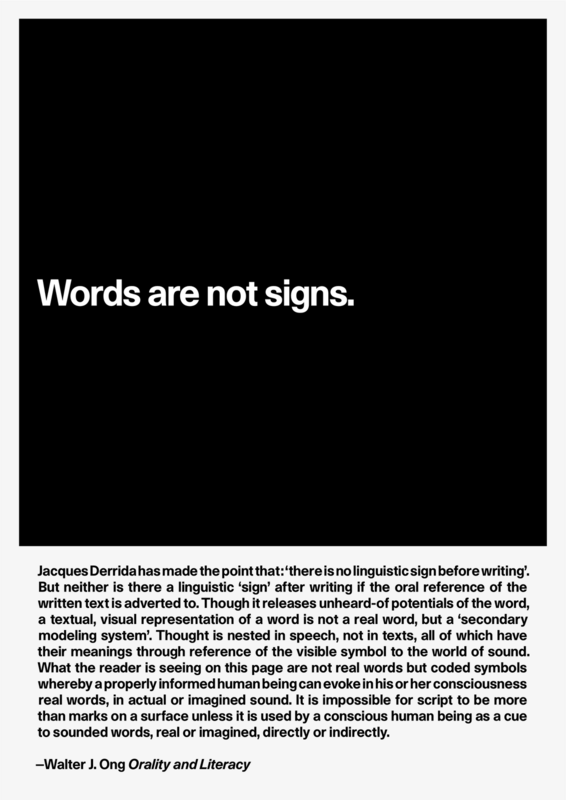 At this stage it was useful to read the essay On Typographic Signification by Gerard Mermoz. 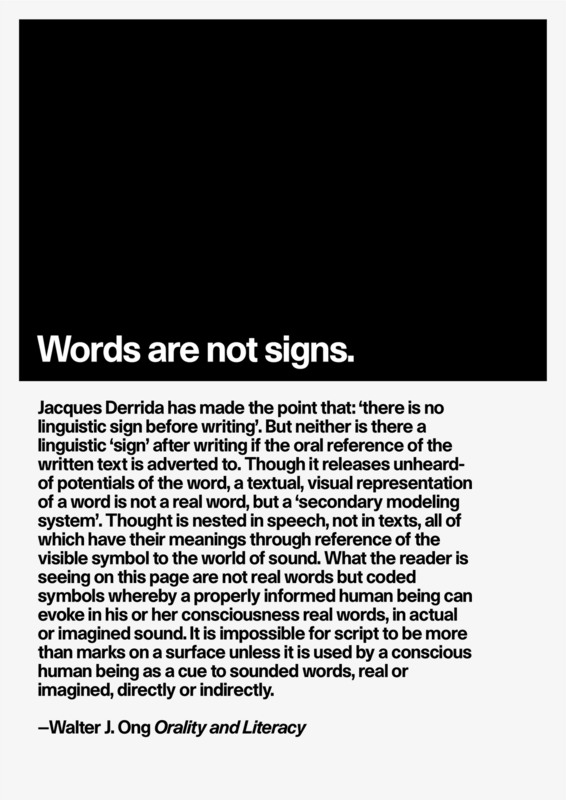 I also found that selected essays in Looking Closer: Critical Writings on Graphic Design 1 and 5 and in Texts on Type: Critical Writings on Typography were incredibly useful in crystallising some of my ideas. A Natural History of Typography by J Abbott Miller and Ellen Lupton; Legible by Gerard Unger; Typefaces are Rich with the Gesture and Spirit of their own Era by Michael Rock; Rumors of the Death of Typography Have Been Greatly Exaggerated by Peter Fraterdus; and Typographical Topography by Stefan Themerson were all useful in forming my ideas for Design and Rhetoric. 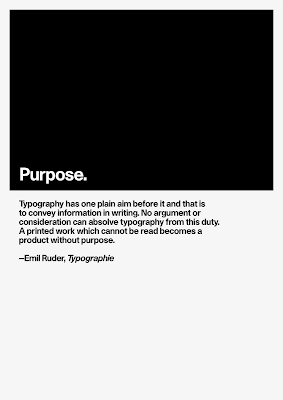 I noticed that books that are made specifically for designers i.e. 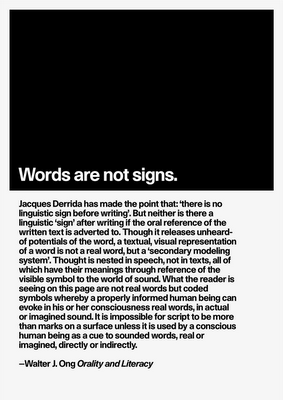 visually aware readers, are often designed in a way that makes explicit use of graphic design methods to make meaning better understood. 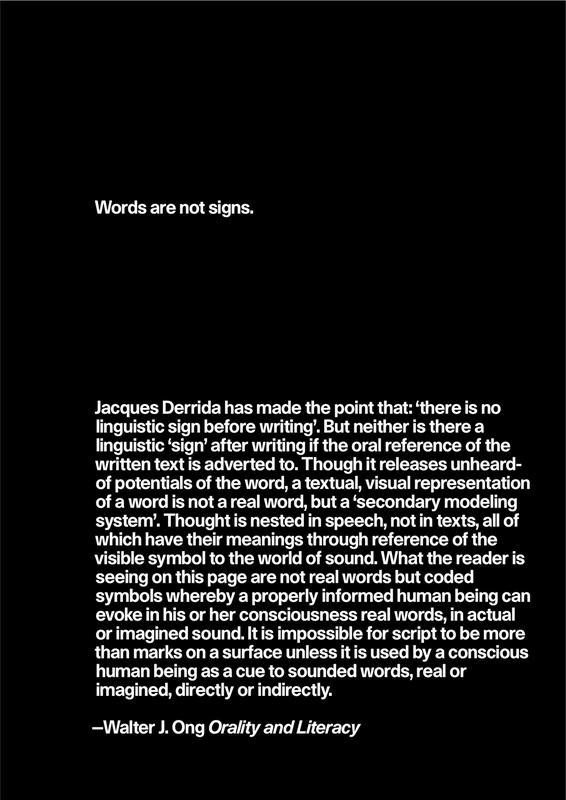 In David Crow’s books Visible Signs: An Introduction to Semiotics and Left to Right: The Cultural Shift from Words to Pictures and in Visual Research by Ian Noble and Russell Bestley, all books written and designed by graphic designers for graphic designers, the text is presented in ways that attempt to make sense of the volume of information being presented, in a way that is, I would argue, above and beyond the usual function of book typography and design. 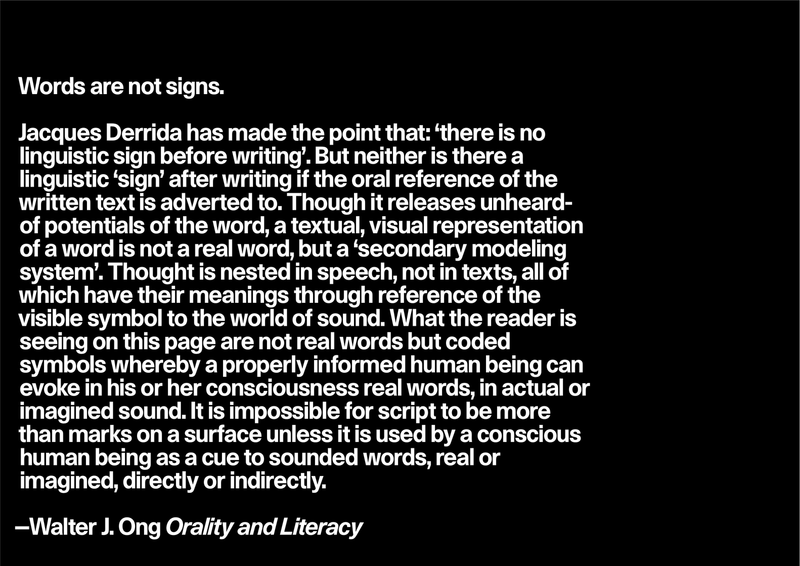 These books present a very different reading experience from Gerard Unger’s “Disappearing Letters” where the “reading object disappears” and the “contents of the text flow directly into the mind of the reader”, rather the layout of the books in these three examples, where there is often two or more texts running concurrently on the page, offer a different reading experience; an animated multi-layered experience that uses repetition, in the form of recaps of information presented in different ways as an aid to learning. 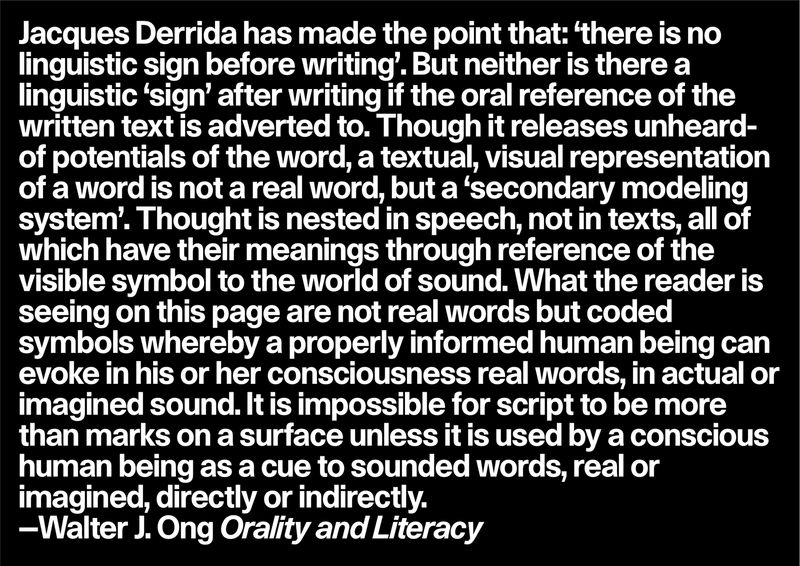 This has parallels with Ong’s observations of how oral cultures memorise texts: repetition is used as a memory aid when stories are passed on from one person to another. 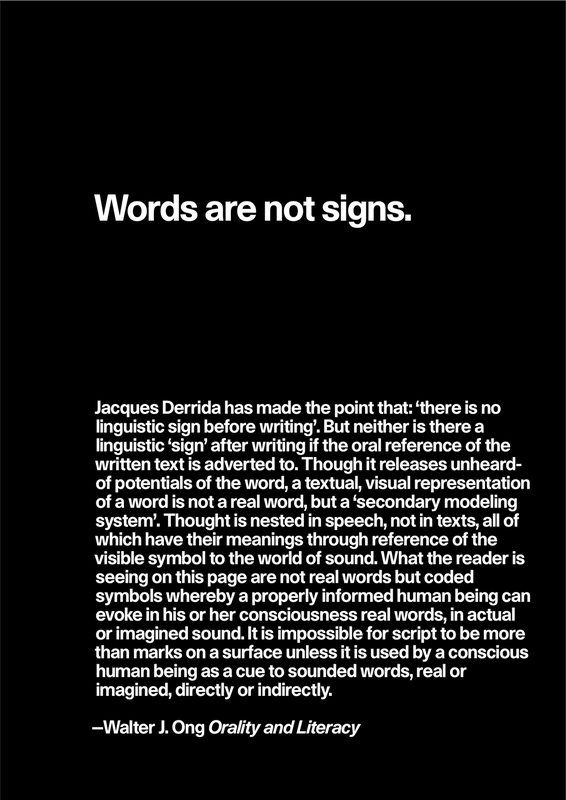 I would also argue that this method of presenting information has parallels to the way information is received in the digital age; clusters of information or soundbites which afford the opportunity for the reader to skim over and navigate their own way through, without a deep, absorbed reading experience. 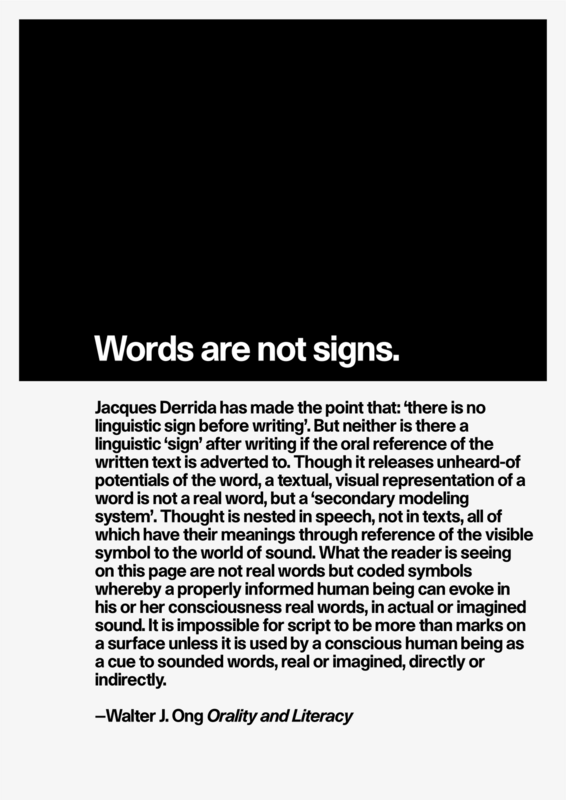 My work for Unit 2.3 has taken the form of a set of posters that have attempted to amplify or make explicit the authorial voice. 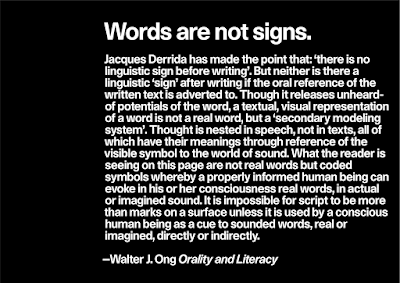 I was thinking about how we read texts, particularly ‘difficult’ academic texts. 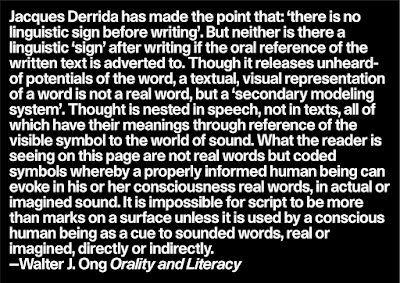 I have spoken to friends who are working on MAs and in academia, about their approach to reading ‘difficult’ texts: one approach that emerged was the idea of reading aloud. This approach involved reading aloud, without pausing and without analysing the words on the page as a way of digesting the text on the level of listening to a speech. Ong talks about the notion of words disappearing as soon as they are spoken unlike the written word, which can exist forever. 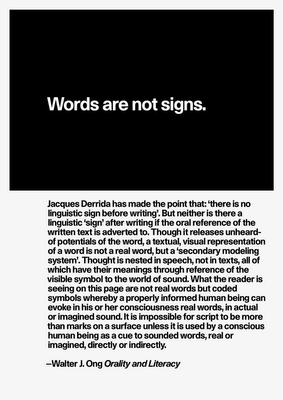 The written word allows us to go back, to analyse the words and try to decode the meaning of a text whereas speech disappears as soon as the words are spoken so the meaning is absorbed in a different way. 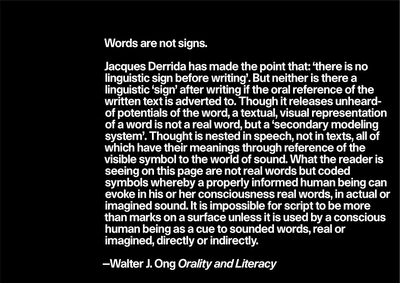 It seems that once you start to analyse a text too deeply it can fall apart – this would seem to fit with the idea of language being created of units that have no meaning on their own but when joined together to make words start to communicate meaning. 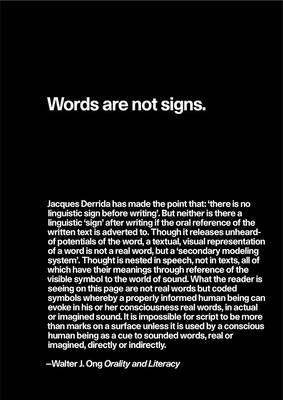 This led me to think about how graphic design might help communicate the authorial voice, translating it into the voice heard in the reader’s head. I attempted some visual tests that took an extract from a text and used the tools of typography (roman, medium, bold, italic, underlined etc) to amplify the meaning of the text by creating pauses and emphasis within a text. 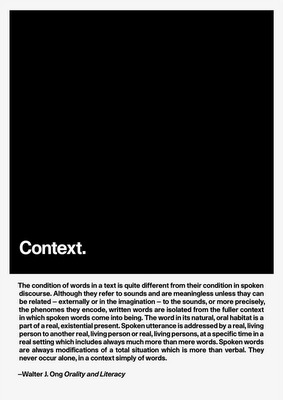 I wanted to animate the reading experience by making more explicit (what I thought were) the pauses and points of emphasis within the text. 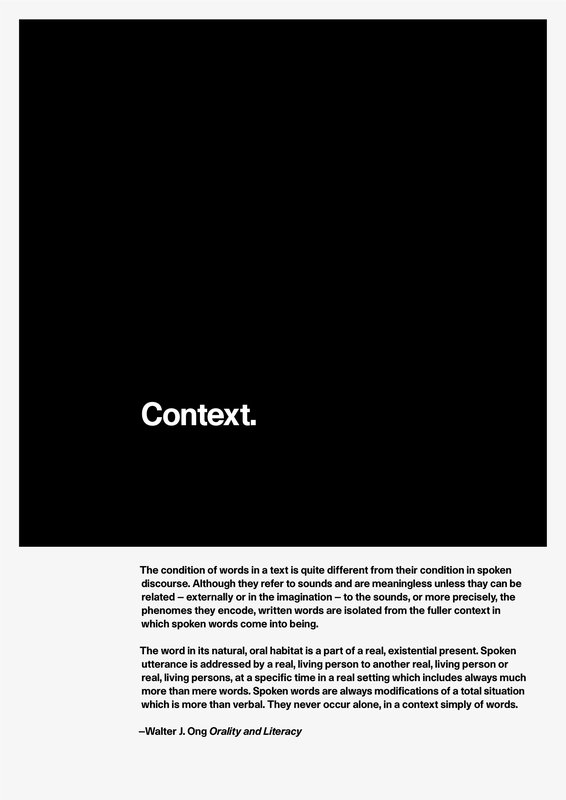 With this system I wanted to create a method that ‘guided’ the reader through the text and controlled the reading experience in order to amplify meaning. This, of course, is highly problematic. Writers already use a limited palette to create meaning and emphasis within texts (punctuation, upper and lower case, italics, bullet points etc) that has a long-standing history and acceptance. This is the conventional manner of ordering a text that we are all taught at school. 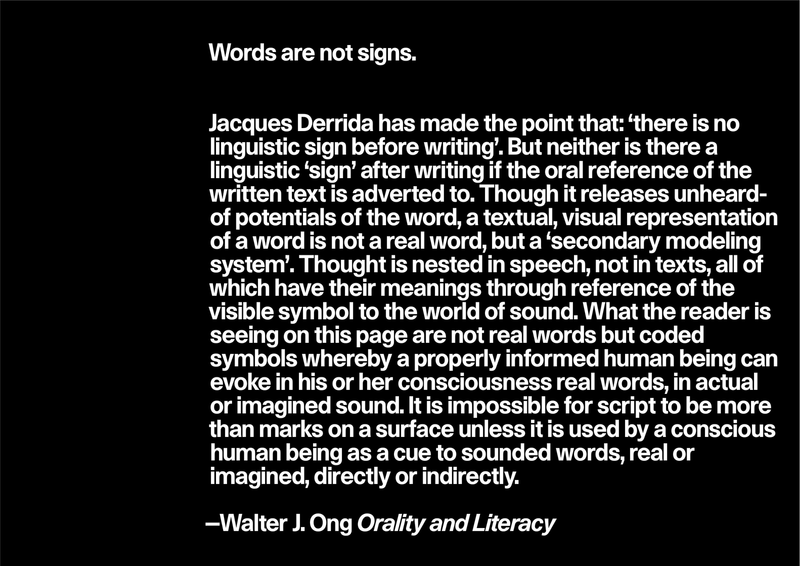 It becomes problematic when a designer tries to create another layer of meaning or another reading of a text on top of the layer already established by the writer. 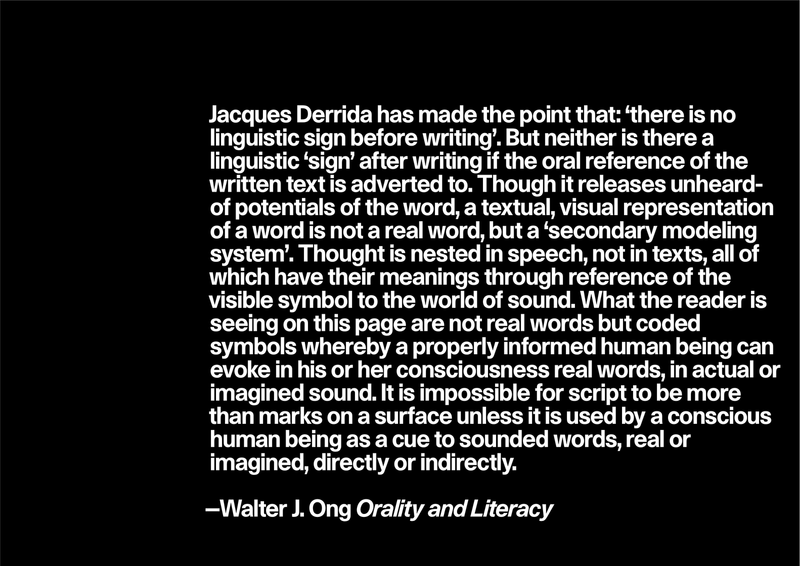 It would appear that one possible blueprint for typography that enhances the understanding of a text by the reader, is a close reading and comprehension of the text on the part of the designer, mediated by typographic hierarchy. 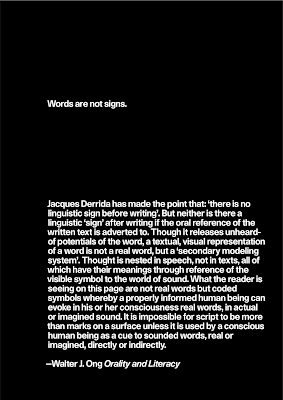 As I read further, I realised just how complex the relationship between language and typography is and how difficult it would be to achieve my goals of animating the reading experience within a book. 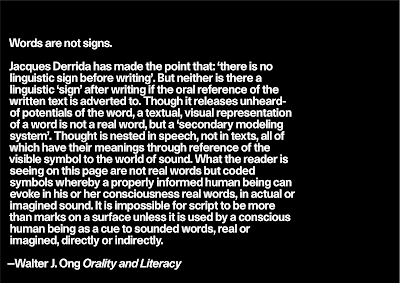 At this point I looked again at the work of 8vo, who had attempted to meld the visual and the word in experiments that attempted to create a new kind of reading. 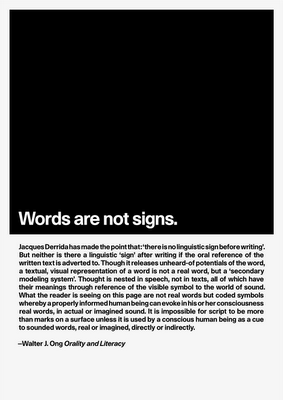 I also looked at concrete poetry where the typographical arrangement of words helps transmit the meaning of the poem as much as the conventional elements of the poem: words, rhythm, rhyme etc. Working for a publisher of books by contemporary artists, I am aware of artist’s sue of form to express meaning within the book format. I was interested to see the new version of Tristram Shandy by Lawrence Sterne, designed by Emma Thomas of Apfel, a novel that has long been considered a benchmark for graphic designerly intervention and interpretation. 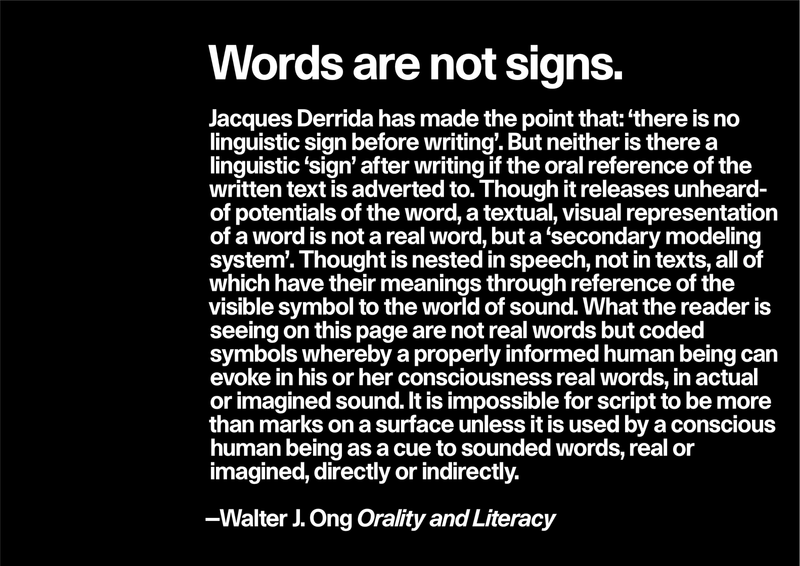 There have been many attempts to mediate the reading of a text, some more successful than others. The problem that I had created for myself was the source material I was looking at was very dense: I could work with quotes in isolation, and possibly chapter-length texts but I anticipated that to animate an entire book which had been my original goal for the final major project would be difficult to achieve and problematic in terms of the authorial voice being replaced by a designerly voice. The other problem at this point was that my designs had become too complex. There was too much going on so, instead of making the author’s voice clearer it was actually obscuring it with a myriad of voices. 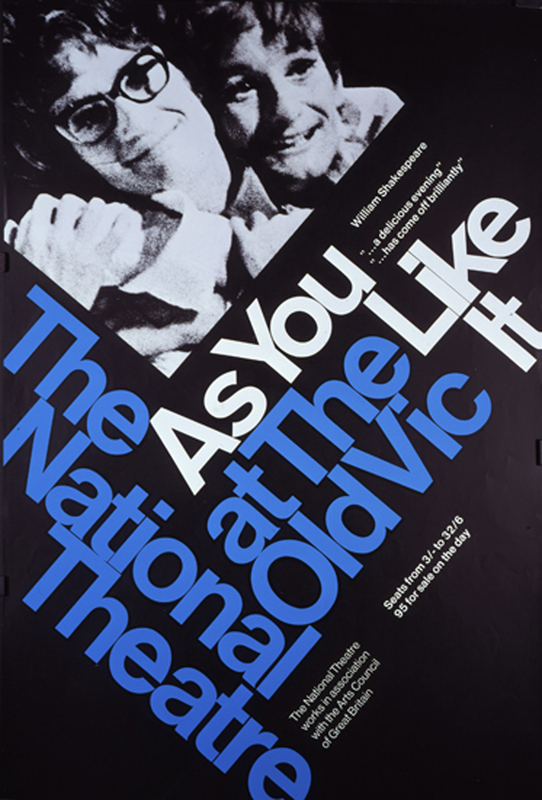 On the advice of Paul I decided to look again at typographic hierarchy in Modernism and, as contrast, at the work of the Cranford School of Design. 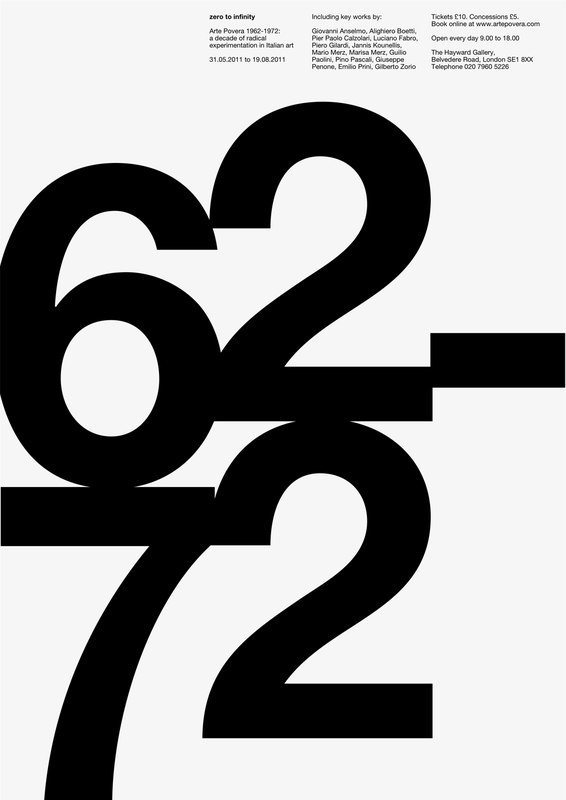 I looked at the work of Emil Ruder, Josef Müller-Brockmann and Armin Hoffman. I also looked at April Greiman’s work and at Neville Brody, particularly Fuse 10 Freeform. Typography Today by Helmut Schmid is a useful overview of some of the major players in graphic design in the early 1980s. 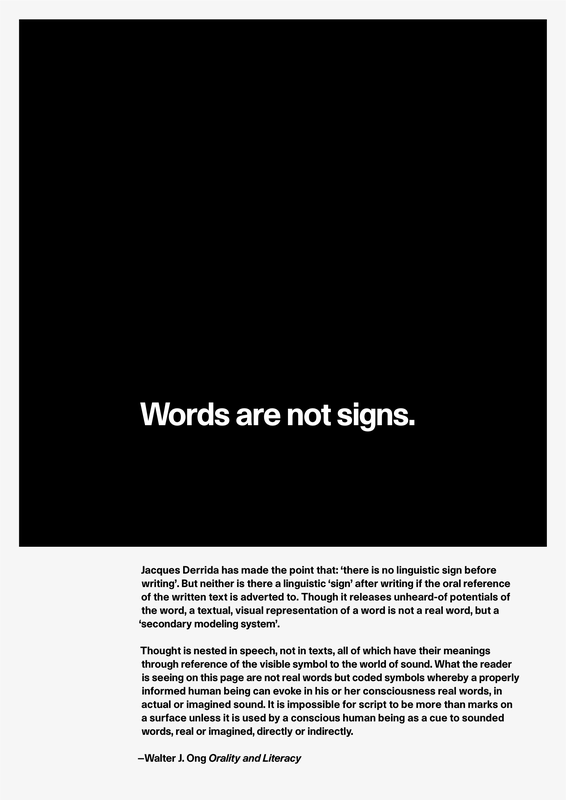 I also read A type primer by John Kane, which served as a useful refresher into the history of letterforms, the development of type and to understand how typography can be used to create hierarchies that enable the reader to better understand the information that is presented. 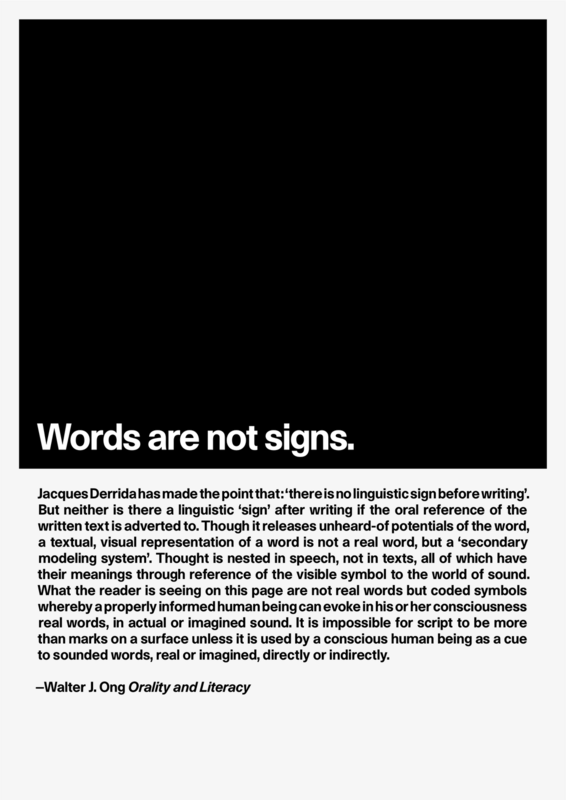 I began to realise that in terms of my outcome for the Major Project Proposal and, to some extent, in Design and Rhetoric, my work was lacking in focus or, rather, it was becoming too self-referential: I was making works that looked at the relationship between speech, writing and typography using, as source material or case studies, texts that looked at the relationship between speech, writing and typography. As satisfying as I find these circular, self-referential relationships, I began to realise that my outcome was becoming too much of a closed circle. It became clear that I needed a strong but simple focus to the project and a set of materials that I could use as a testing ground that I could hang my ideas on to. Paul suggested (possibly half-jokingly) that cookbooks could be a possible focus. This immediately struck a chord. Living and Eating by John Pawson and Annie Bell had already been mentioned in a previous tutorial so a seed had been planted and, as it grew, I began to think that cookbooks could be a useful focus for my research. I am a keen cook and I collect cookbooks: I have about 35 books, ranging from facsimiles of A Plain Cookery Book for the Working Classes by Charles Elmé Francatelli through 1960s vegetarian cookbooks to The Moro Cookbook via books by Nigel Slater and Nigella Lawson. The recipe book exists on many different levels: as lists of recipes; as historical document; as reflections on food; as distillation of lifestyle; as propaganda; as autobiography. Recipes are presented in numerous ways that reflect the diversity of approaches to typographic hierarchy: as simple lists of ingredients; as sets of instructions; as diagrams; as sequential photographs; as continuous text; as bullet-pointed lists of instructions; as numbered lists of instructions; as conversations. How this information is presented will be the primary focus of a visual audit that will unpick the various typographic means that hierarchy is created within the convention of the recipe (recipes generally consist of a list of ingredients, sometimes a list of equipment, a set of oven temperatures and cooking times, a set of instructions and a set of timings for preparation and cooking). 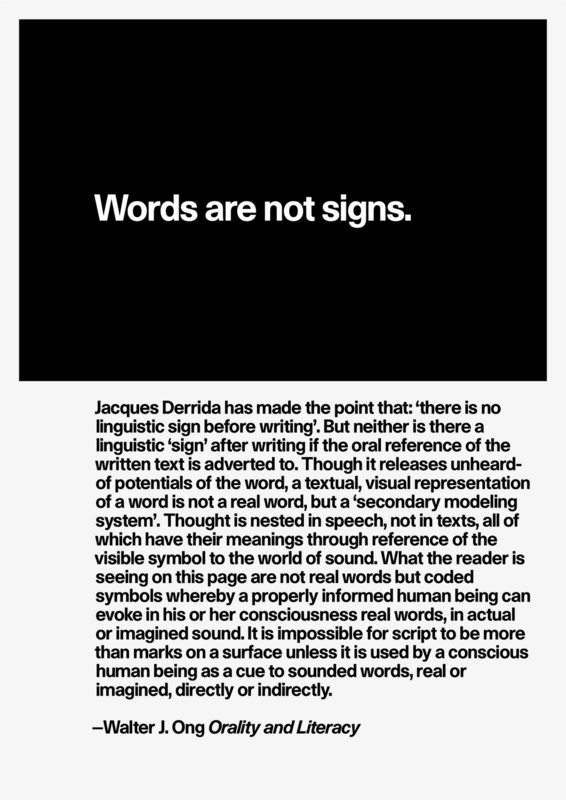 A second focus of the visual audit will be the graphic language of cookbooks: how the authorial voice is created and amplified through typography, photography and graphic design. Cookbooks exist on many different socio-political levels: in the seventeenth century recipe or receipt books contained a sometimes queasy mix of culinary and medical recipes; they can be political – wartime cookbooks as issued by the Ministry of Food are a kind of propaganda, vegetarian cookbooks can be positioned within the wider sphere of alternative anti-establishment lifestyles that emerged in the 1960s; cookbooks can be instructional in the forms of kitchen bibles aimed largely at women setting up home; they can exist as historical documents, reflecting the changes in eating habits for example the interest in Mediterranean food that coincided with the rise of air travel; they can also be aspirational, reflecting an idealised lifestyle as presented through food. Traditionally, most domestic cookbooks have been aimed at women, as it is women who have traditionally maintained the home; cookbooks reflect the contemporary shift in domestic arrangements where (some) men now share the cooking. Some cookbooks are aimed at professional chefs but I intend to concentrate on books that are aimed at the home cook. There are many different categories of cookbooks that are aimed for the home or amateur cook: kitchen bibles are basic reference books that include all types of cooking and sometimes home management (Delia Smith’s Complete Cookery Course); some are linked to restaurants (The Moro Cookbook); others to professional chefs (Gordon Ramsay); some are linked to television or newspaper columns (Jamie Oliver, Nigella Lawson and Nigel Slater); ethnic or international cookbooks look at cooking from other cultures ( The Silver Spoon and Madhur Jaffrey); other books look at single subjects - a specific ingredient, technique, or class of dishes (The River Cottage Fish Book); some are about food history (Marguerite Patten's Century of British Cooking). The history of cookbooks is rich and extensive. A historical survey of recipe books will be a useful for contextualising my findings but I think that I need to narrow my focus. I propose to limit my visual audit to books produced within the last 20 years. As well as my own collection of books I will be able to draw on the books owned by my friends and from fellow students at LCC. Libraries will be another source of research material. 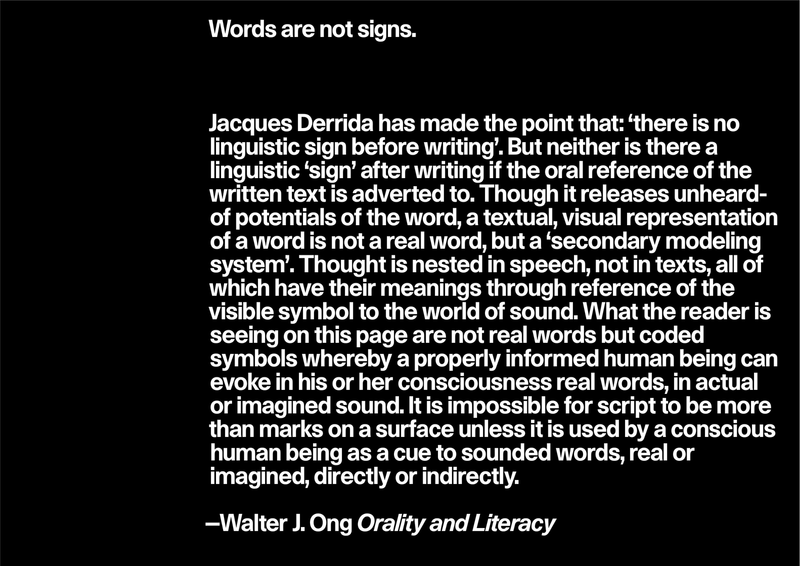 Abbott Miller, J & Lupton Ellen (1992) A Natural History of Typography. In: Bierut, Michael et al (Editors)(1994) Looking Closer, Critical Writings on Graphic Design. New York, Allworth Press. Unger, Gerard (1992) Legible? In: Bierut, Michael et al (Editors)(1994) Looking Closer, Critical Writings on Graphic Design. New York, Allworth Press. "My research deals with meaning in graphic language, especially in book design and diagrammatic representation. I am interested in the way that illustrations, diagrams and various forms of text interact to convey ideas: the graphic language of “complex texts”. As a case study, I am looking at commercial non-fiction books on science for older children, published in the UK. 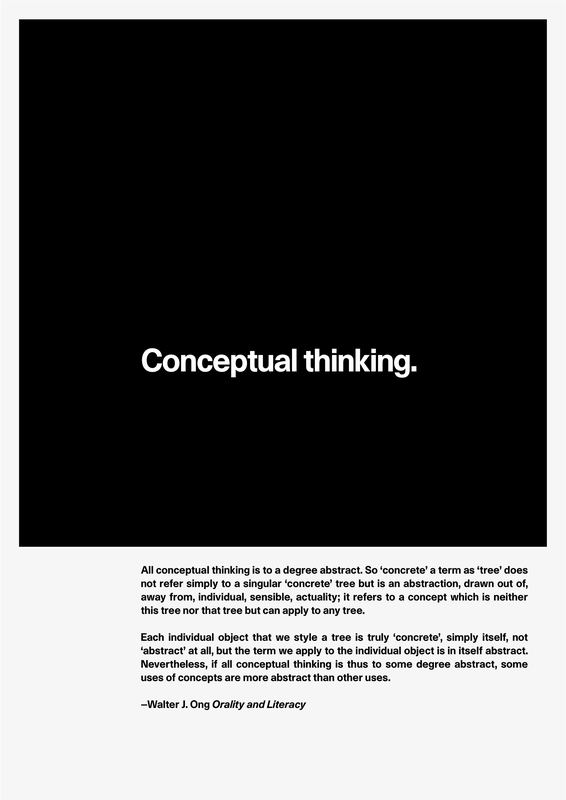 My research examines how design contributes to meaning in a text, and the nature of graphic genres in this form of publishing." Further refinement and development of hierarchy within text using one weight of typeface (Unica); contrast of type size; and contrast of colour. 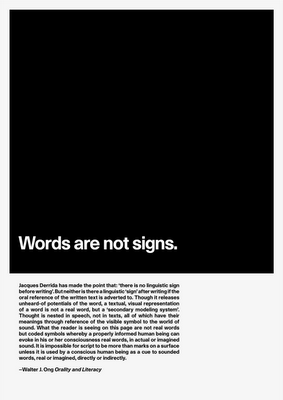 See also Typographic Hierarchy 1 & 2. 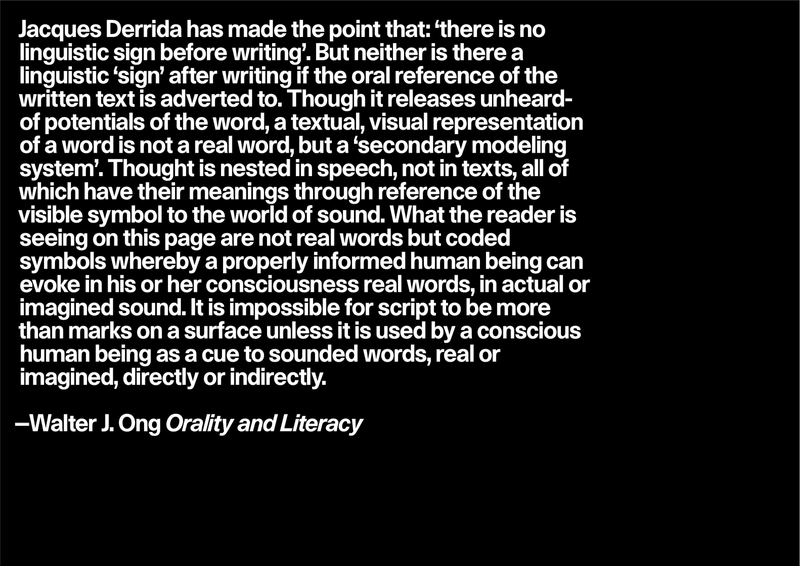 Further development of hierarchy within a text using only one weight of the typeface (Unica). 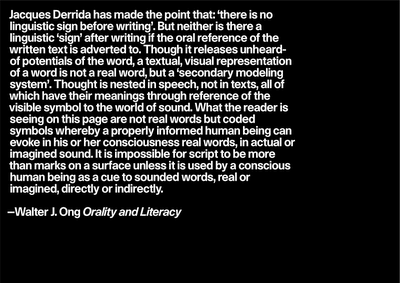 Hierarchy was established by changing the space between the 'headline' and the body text and, in some cases, by enlarging the point size. 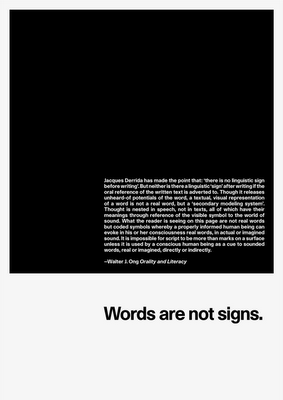 I moved the position of the text within the frame of the page to develop tension within the design. 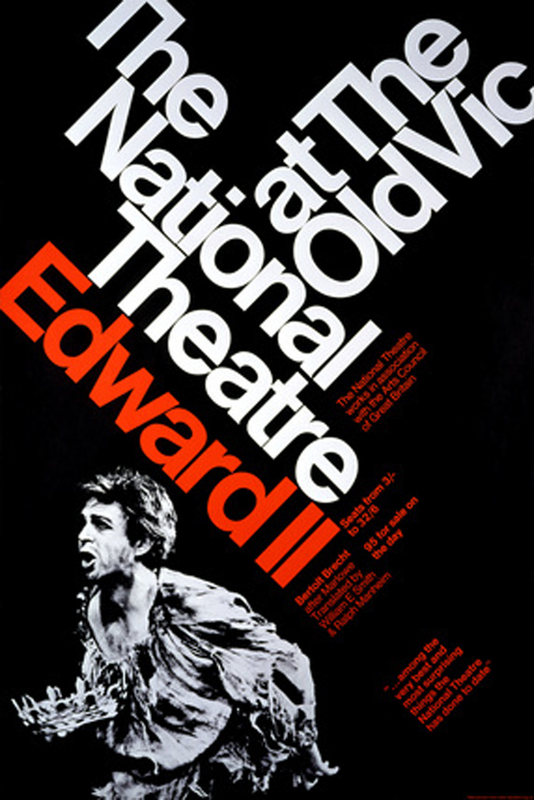 Three posters (1967-68) for the National Theatre by Ken Briggs.